You don't need to manage your own servers to build powerful Web applications. Need proof? 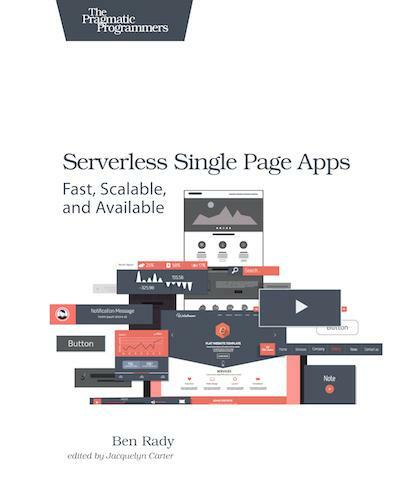 Pick up Ben Rady's new book Serverless Single Page Apps: Fast, Scalable, and Available (published by Pragmatic Programmers), a guide to creating single-page apps that run entirely on Web services, scale to millions of users and cost amazingly little. Readers of Rady's book will skip over building an application server, avoid messing around with middle-tier infrastructure and get right to the Web app their customers want. Using a Web browser, a prepared workspace and an editor, readers learn the fundamental technologies behind modern single-page apps and use Web standards to create lean Web applications that can take advantage of the newest technologies. They'll also deploy the application quickly using Amazon S3 and utilize Amazon Cognito to connect with providers like Google and Facebook to manage user identities. Other topics include DynamoDB for reading and writing user data directly from the browser and Amazon Lambda for creation of scalable custom microservices. Serverless Single Page Apps is for those who either have never built a Web application before and seasoned Web developers looking for an alternative to complex server-side Web frameworks.